Welcome! We hope you enjoy exploring our website and learning more about our program! We are passionate about our work and excited to see our clients succeed both inside and outside the arena. We'd love to meet you! Please contact us with any questions that you have or if you'd like to set up a visit. We are passionate about developing and educating horses and riders for nearly all events. Mike and May reside on premise to ensure the safety and well-being of their equine residents. 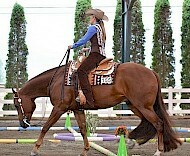 Explore our photo collection of our clients and their horses. Our selection of horses currently offered for sale.